(Portland, Oregon) – Yet another falling stellar body will be making an appearance above Portland for the next few days. 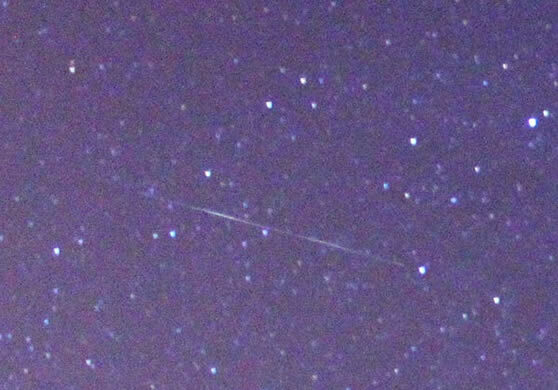 The German satellite ROSAT is predicted to re-enter the Earth's atmosphere on Sunday, October 23 – and where it will wind up is again a mystery (photo above: a shooting star above Portland this summer). Jim Todd, planetarium manager with OMSI in Portland, said it the satellite will be visible from Portland – indeed all of Oregon – until a day or so before it crashes. The website Heavens Above has the full schedule for the sightings in the Portland and general Oregon areas. According to the site, for the last few days it's been visible twice a night – almost every two nights. Tonight (October 19), it can be seen about 7:24 p.m. for about three minutes, going from the west to the SE. It will again pop up about 8 p.m. For three minutes on October 20, and on October 21 at 7:34 p.m.
Like the satellite fall last month, this one could crash just about anywhere. “Where it will fall is yet to be determined,” Todd said. The ROSAT x-ray space telescope is predicted to hit the atmosphere around noon on October 23, Universal Time. It was launched in 1990 by NASA and managed by the German Aerospace Center (DLR) over most of these years. This satellite is larger and heavier, and it's made of more heat-resistant materials. Because of this, scientists predict more pieces will hit the Earth – as many as 30 chunks could survive the re-entry. According to SpaceWeather.com, the largest single fragment could be as large as 1.7 tons. The online publication also said that scientists originally predicted the satellite to crash in December, but an unusual and unexpected amount of sun spot activity has heated up the Earth's atmosphere, causing it to expand enough that the orbital object is coming down sooner.